Why choose White or Black Acrylic? The main reason is so the edges and back of your sign are this colour. If your artwork on the sign is black then it makes sense to select a black panel, if its primarily white then a white panel is usually most suitable. Of course for a contrasting effect you can have a white print with a black panel, it all comes down to the look you are trying to achieve. For all black and white acrylic signs the graphics are printed and laminated then applied to the front of the panel. Selecting clear acrylic can add a whole new dimension to the look of your signage. When selecting clear acrylic you open up the option for the printing. Option 1 is to have the print applied to the front of the panel which will then leave you with clear edges, just like the above options. Option 2 is much more interesting. We are able to print the graphics and apply them to the back of the panel so that you look through the clear acrylic to see your image. 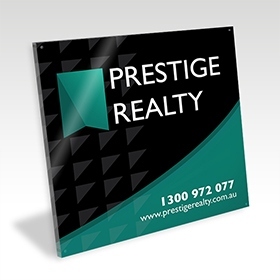 This adds depth to the sign and gives it an amazing glossy finish. To produce the sign this way we print onto clear vinyl instead of white. The mirror image of your graphic is printed, it is then laminated with a white vinyl and then applied to the panel. The result is your image is seen the correct way looking through the clear acrylic and the back of the sign is white. We use sheets that come in the size of 2440mm x 1220mm, so you can order your signs up to that size in one piece. We can also cut the panels down to any size as small as 100mm x 100mm. You can work out pricing on our instant pricing calculator for any size you require, you do not pay any extra for your custom size, pricing is based on the overall size of the sign. Our pricing is actually based on the overall square meters of signage you order, so the more you order the cheaper the square metre rate will be. Click here to visit our acrylic panel sign page and use our instant pricing calculator to work out a price for your signs, you can work out bulk quantity and custom size pricing. Once you get your quote you can simply add it to your cart, checkout and upload your artwork! Read about how our ordering process works on our process page. 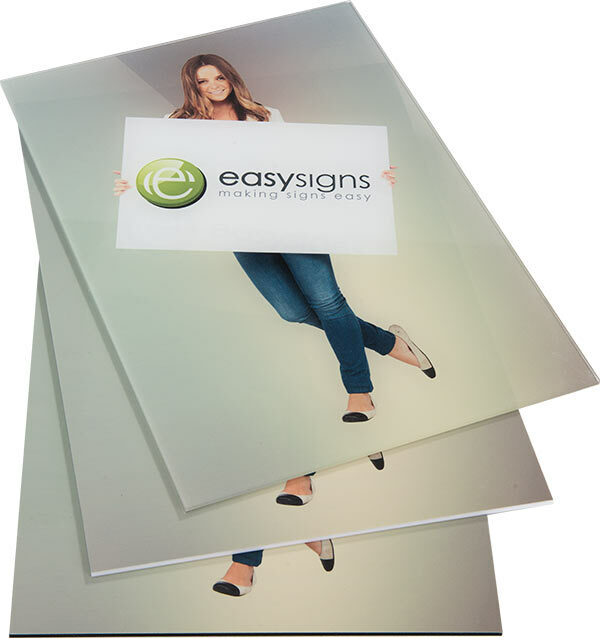 ​High quality Acrylic Signs with full colour digital print. Available in a range of sizes and printing options. Produced in just 48 hours and delivered anywhere in Australia for only $14 inc GST (up to 1220mm size)!